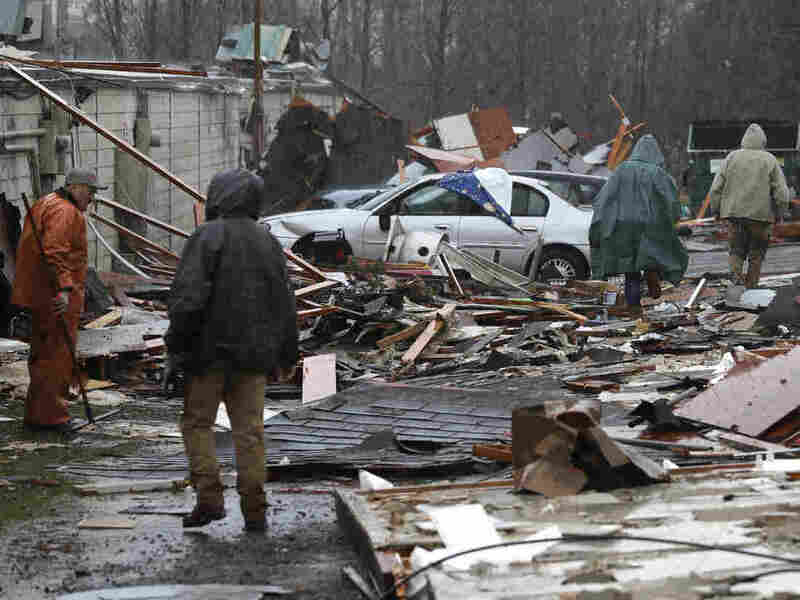 Tornado Touches Down Near Seattle, Causing Damage But No Deaths The Port Orchard twister was extremely rare, especially for December, says the National Weather Service. No serious injuries were reported, but homes and other buildings were affected by the storm. People walk through debris at Salmonberry Dry Storage in Port Orchard, Wash., where a rare tornado touched down Tuesday. The National Weather Service said on Wednesday a rare tornado that touched down near Seattle was the strongest to hit Washington state since 1986 and carried winds up to 130 mph. The service gave the twister an EF-2 rating on the Fujita scale, indicating it caused considerable damage. It touched down about 15 miles west of Seattle, on the outskirts of Port Orchard, Wash., on Tuesday shortly before 2 p.m. local time, the weather service said. "It's very, very fortunate no one was injured and no one was killed," Logan Johnson, meteorologist in charge at the service's Seattle office, told NPR. "One family narrowly escaped being injured by trees that actually were falling on the house after the tornado passed by," Johnson told NPR, adding that several homes "suffered pretty significant damage." Johnson said he was part of a team that spent much of the day surveying the damage from what was the first tornado in Washington state this year. He said the weather service could not yet put a dollar amount on the damage. Emily Silverman told Seattle's KOMO-TV she got caught in the storm while in her car with her husband and 2-year-old son. "Our car back windows blew out, our side windows blew out," Silverman said. "There were things flying everywhere. I thought I was a goner." Dana Stone first heard a loud pop. Then the power went out and a loud hum arose, she told The Seattle Times. "Her grill was flying about the backyard. The roof of her deck had been ripped off. Tables and chairs had been tossed away. Something crashed through her bedroom window," The Seattle Times reported. Stone called her neighborhood "a disaster," but told the paper she and her neighbors came through the ordeal fine. Despite all the rain Washington gets, the state generally doesn't experience the kind of atmospheric instability that gives rise to tornadoes, meteorologist Jacob DeFlitch, who's also with the weather service in Seattle, told NPR. Washington averages about 2.5 tornadoes annually, with an average of only 0.1 occurring in December, according to weather service statistics. The storm was shallow, about 10,000 feet high, whereas big tornadoes in the Midwest are typically 50,000 feet. And it developed quickly, giving the weather service no time to issue a warning, DeFlitch said.